Unlike in electric guitars, acoustic guitars are die-hard units. They rarely get the boost and coloring effects that electric guitars get from amps and pedals. So you get the raw tone from your strings with no added effects whatsoever. Create a glass ceiling to your skills and fun! 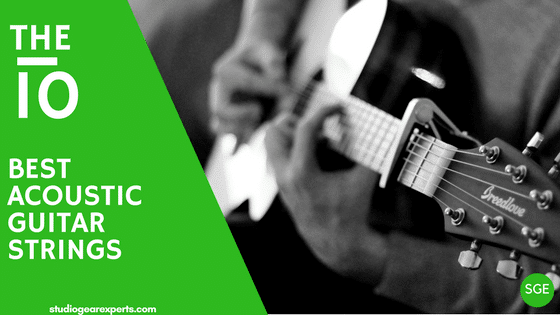 Fortunately, just a few tips on how to choose the best strings for acoustic guitars could open up a world of infinite possibilities regarding playing styles and sounds. That’s the impetus for this acoustic string buying guide. With close to 2 centuries in this industry, Martin are ultimately some of the best strings for acoustic guitars. The MSP4200 is amongst the most popular in their SP series and has been around for over 20 years. Martin MSP400 comes in a pack of 12. They are medium-gauge strings made of Phosphor Bronze. They have a high-quality build and are not easy to break. In addition, their alloy composition gives them a fuller, high-leveled, and deeper tone. It also enables them to retain this tone for long. But what makes them the best strings for acoustic guitars is that they don’t slice your fingers and don’t bend easily. Next on line is a model that won’t miss on any list of the best heavy gauge acoustic guitar strings. It comes from a smash-hit brand famous not only in America but other parts of the globe too. There’s more to love about these strings other than their great pricing. First, they have a bright sound that seems to last longer than most other strings. Second, these strings have a consistent performance. They also have Elixir’s Nanoweb coating that gives them a smooth feel and also minimizes finger squeaks. Even better, this coating prevents sweat, oil, and moisture from corroding the strings and deadening their tones. If you’re just starting out or you’re looking for a replacement for your extra light strings, Martin M170 is worth considering. These strings use bronze alloy that gives you bright and clear trebles. Martin M170 are also great options for guitarists who are looking for deep and rich bases and good longevity of sound. A few perks that make Martin’s M170 some of the best strings for acoustic guitars include their excellent playability, great consistent sound, and long life. However, as with other sets of extra light acoustic guitar strings, you’ll want to change these strings regularly for top-notch sounds. Martin M150 are best for players who don’t want to spend a huge chunk of change on medium gauge strings. With moderate use, these strings can take you for up to 5 months thereby giving you a considerable bang for your dollar. About performance, we realized that there was a noticeable decline in the brightness that these strings had several years ago. However, they are still as loud and boast a deep rich bass. Their highs are also quite good though not as crispy as they used to be. Are you thinking of a set of strings with deep bass and superb high notes? Ernie Ball Earthwood is probably what you have in mind. Though this brand doesn’t always come up in all debates on the guitar strings for acoustic guitars, it has some really good medium light strings here. The sweet spot with these is that they are way affordable but don’t feel cheap. They have a bright, clear and rich sound. Ernie Ball Earthwood strings feature hex shaped steel core with tin plating. Bronze alloy is then wound around the core to make them strong and to give them a long life. Brad Paisley and Maroon 5 are among other traveling musicians who can swear with Earnie Ball 2146. It’s, therefore, very safe to consider them one of the best acoustic strings for beginners as well as professional guitarists. But what caught our attention is the rich, expressive sound that these strings offer. Scouring a little bit on their construction materials, we found that Ernie Ball 2146 consist of copper (92%), tin (7.7%), and phosphorus (0.3%). This combination is responsible for these strings’ warm and rich tone. It also offers them a great break-resistance. Ernie Ball states that these strings have been made with the freshest materials. The 12 strings are then packaged in Element Shield Packaging to keep them fresh until the day you use them. Elixir 11052 strings currently are one of the best-selling acoustic strings, of course for a reason. These strings are made of 80% copper and 20% zinc. They also feature Elixir’s patented Nanoweb coating technology that protects the wire from corrosion. As expected, these strings last up to 3.5 times longer than their average competitors. This coating also minimizes finger friction which is a handy feature for those who play mostly by their fingers. The ultra lightweight coating also makes these strings the best for real ‘’string destroyers’’ since the string becomes a tad harder to break. About performance, Elixir 11052 strings have a narrower and mellower tone than what average phosphor bronze strings offer. Do you play medium? Look no further than the 11100. This set of 12 strings is pretty similar to the 11052 above only that the latter is of a medium gauge. What this means is that the string are made of up a durable alloy (80% copper and 20% zinc) that will serve you for a long period thereby save you money and the hassle of regular restringing. As it’s the norm with Elixir strings, this set also has polyweb coating to keep gunk off the windings. The coating also minimizes finger squeak by making the string feel smoother and softer. In addition, this coating tends to subdue the high ends thereby giving your tones a warmer and full-bodied tone. D’addario is among the oldest brands in this niche. It’s, therefore, not surprising that 2 of its units top our list. Their most revered model the EJ17 was introduced to the market in 1974. It quickly rose to be one of the most sought-after medium acoustic guitar strings. It still reigns supreme to date. This is largely attributed to its build. It consists of Phosphor Bronze that has been precisely wound onto a high carbon steel core. These materials are long-lasting and give the string a heavy tension that translates to bolder and well-balanced tones. Again, these strings are corrosion resistant. So they have great intonations that last long. They are also professionally packaged to remain fresh always. Taking our #1 in 2017 is D’addario’s EJ16. These strings come in a pack of 10 sets. The 10 sets are what you need if you are fond of breaking your guitars’ strings and if you don’t want to waste time ordering for new sets. D’addario EJ16 are light gauge strings. Just like other strings in D’addarios EJ series, these wires are made with the player in mind. They are of great quality and have excellent performance. They have carbon steel core with a round wound of corrosion resistant phosphor bronze. As expected, this construction makes them great or beginners and pros and for different music genres. They have warm, bright, and clear intonation with a good amount of resonance. Again, the tone feels full though not as crisp. Lastly, they don’t stretch easily. So, if you're looking for the best sounding acoustic guitar strings, this is one of our recommendations. Worth mentioning is that acoustic guitar strings are made of different types of materials. These include silk, nylon, steel, bronze, and phosphorus. Of all these construction materials, bronze and phosphorus are most common. Again, be informed that most of these materials are used in their alloy form- an amalgam of 2 metals. These are the best acoustic guitar strings for jumbo guitars. They have clear bright tones that add some life to these guitars’ huge low end. Their tones appear warmer and a tad darker than bronze strings. The small amount of phosphorus in these strings helps them retain their sheen and tone much longer than bronze strings. These emphasize more on bass. They also have well pronounced crisp highs and are clearer than phosphor bronze strings. These materials create the best acoustic guitar strings for fingers. They have a steel core wrapped with copper, silk, or nylon. They produce mellower sounds. Coated acoustic guitar strings- what difference do they make? Sure! You’ll also find some major brands – Elixir, for instance- offering you plastic-coated strings. The essence here is to prevent dirt and oil from building up in the small spaces between the windings. This has its ups and downs though. First, it prolongs the string’s life up to 4x longer than the uncoated strings- a good thing if you are a heavy-handed strummer and if you want to save more. Second, coated Phosphor Bronze strings also come as a remedy for acoustic guitars that sounds tiny- Martin and Taylor, for instance. They also reduce finger tweaks. On the other hand, coated acoustic guitar strings are pricier. The coating also tends to affect the string’s high-end frequencies and the volume too. Bluntly put, string gauge refers to how thick or thin the string is. Do you get it? The string’s diameter affects its sound and the feel on your fingers. Usually, strings are rated anywhere between extra light and heavy. Extra light, normal light, and light gauge sets form the best acoustic strings for beginners. This is because they are easier to pluck and are soft on your fingers. Unfortunately, the thinner the string is, the easy it is to break. So you also need to be gentle with them. As a general rule, light strings do well with small bodied parlor guitars. Medium and heavy sets bring out the big sounds in large and jumbo guitars much better. How you play your guitar also matters a great deal. For finger-pickers, consider going for light strings since they are soft on your finger tips. While you could as well try out medium and heavy strings, these gauges may cause your fingers more sores. They also have little flexibility and can’t be bent easily. Strummers will do quite well with heavy strings. If you alternate between the 2 styles, a medium set is what you need. Light gauge accentuates your guitar’s treble notes. On the other hand, heavy strings emphasize more on the bass.